Hi There! Thank you for visiting my profile. I am a Kolkata based freelancer. I offer the below services with best quality & lowest possible rate. 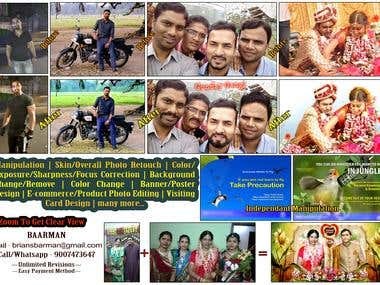 -Photoshop (Basic/Advanced Retouch, Restoration, Manipulation for Pranks/Banner/Advertisements/Personal Use etc, Background Removal/Change, Color Correction/Replacement, Caricature, Greetings Card, Message Design, Poster/Banner, YouTube Thumbnails etc) -Subtitle (Movie, Docs/Short Films, YouTube Videos, Personal Videos etc) -Translation -Transcription -Photography -YouTube (End to end guidance on YouTube channel set up, SEO, Thumbnail -Advanced Excel (Data Entry, Sorting, Dashboard, Data Presentation etc) -Logo design -Data entry -Creative writing. -Bengali, English, Hindi Language related job. -PowerPoint Presentation -Business Names -Language assistance for your India/Bangladesh tour. I am always approachable even you don't need me to work with you. Hence, pleas feel free to connect if you have any query. Thank again, have a good day!